Railway Stakes runner-up Material Man (centre) will have his first Melbourne start in the G1 Orr. 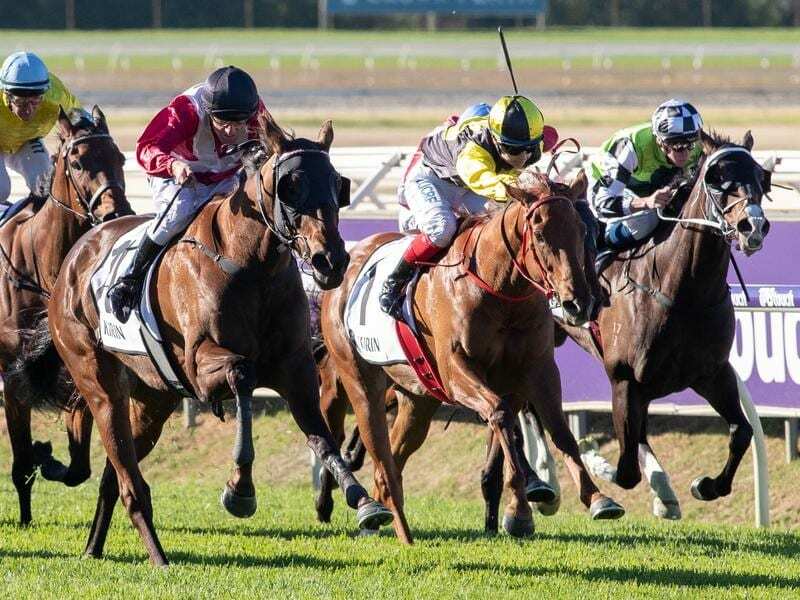 Well-performed West Australian gelding Material Man has travelled across the country to take on a number of the eastern states’ high-profile horses in Melbourne’s feature races. The seven-year-old Justin Warwick-trained gelding arrived in Victoria early on Wednesday and begins his campaign in Saturday’s Group One C F Orr Stakes (1400m) at Caulfield. “Ideally he can go from the Orr to the Futurity Stakes, then probably the Newmarket Handicap and then seven days later up to the mile in the All-Star Mile would be ideal,” Warwick said. “Every race is a big race. There’s three Group Ones to go into and if he’s still in one piece and still competitive come the All-Star Mile, of course that would be the grand final. “I don’t know, but I wouldn’t have travelled him over if I didn’t think he would be competitive,” Warwick said. “We’ll find out on Saturday. “He has run second in two Group Ones so he’s not far away. “The depth is probably stronger here but he always acquits himself well. “I think he’s as good as ever. “His best and worst is pretty close together. Touch wood, he doesn’t put in bad performances and if he gets beaten it’s usually because he’s not good enough. Warwick’s daughter, Lucy Warwick, has ridden Material Man in the majority of his races and again takes the ride in the Orr.